More like Glenmore elementary hair raiser. Glenmore elementary school is having its annual fundraiser at Chili's on Fremont Boulevard. Right next door is a haunted house "Ghost House" and lots of scary and fun activities for the children and family to do while donating money to Glenmooor Elementary. It is such a fun way to enjoy a spur of the moment fun time during the week and donating money to a great school in Fremont. Go Wildcats! Glenmore elementary real estate shows no signs of slowing down that much during this fourth-quarter. 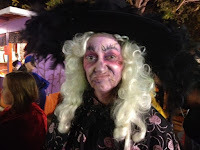 Our close friend and 5th grade Glenmor Elementary teacher Mrs. Prescott wears the witch costume all too well. If you get a chance, see if you can come out and donate to Glenmore elementary school and have a good scare at the same time.